The Chinese New Year of the Wood Horse starts on January 31, 2014. The celebrations, as always will last for 15 days. The coming year is a very special year in the Chinese calendar. Why? Read on to find out. But first, let me explain why this year is called the Year of the Wood Horse. Just like in Western astrology, there are 12 zodiac signs in the Chinese horoscope. However, since the Chinese system is based on EARTH WISDOM, each sign is denoted not by a celestial body, as in Western astrology, but by an earthly animal totem. Although there are only 12 animals in the Chinese Zodiac wheel, in actuality each year configuration can repeat only every 60 years, and here is the reason why. In addition to animal signs, the Chinese system also goes by the five elements: water, wood, fire, earth and metal. Therefore, there are 5 types of each animal, depending on which element cycle we are in. Consequently, there are five types of the Horse Year. We have now switched from the WATER to the WOOD 5-year cycle. Therefore, The New Year 2014 is the YEAR OF THE WOOD HORSE. The color of wood is green (and also brown as in the trunk of a tree), so the Year of the Wood Horse is sometimes referred to as the Year of the Green Horse. Meanwhile, the horse itself rules the SOUTH of the Chinese zodiac wheel. The color of the south is RED – denoting fire – therefore the self-color of the HORSE is red and its self-element is fire. 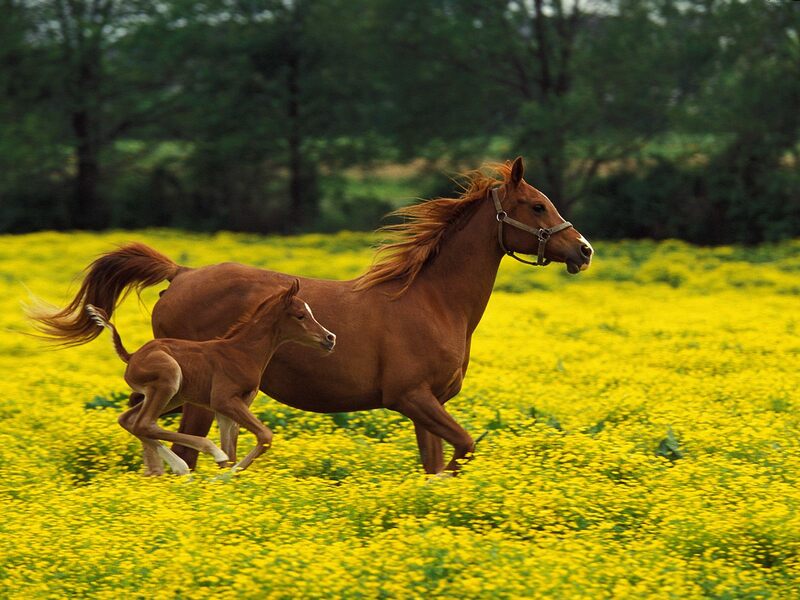 This gorgeous photo of two beautiful brown horses (the mommy and her baby, denoting protection, nourishment and future growth) galloping joyfully through a lush blooming meadow, to me represent the core essence of the WOOD HORSE. 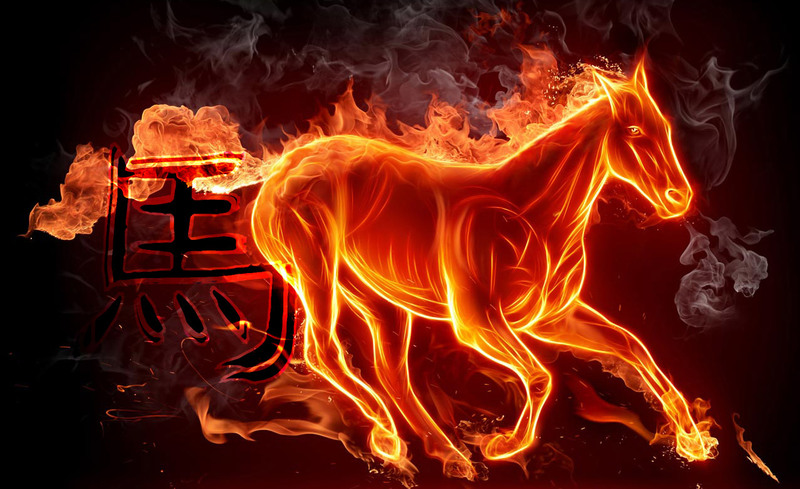 As mentioned above, the Horse resides in the SOUTH of the Chinese zodiac wheel, thus symbolizing the fire element. In the Chinese numerology, the number associated with the south and fire is 9 (nine). The number 9 is called the great multiplier. This is because if you multiply 9 by any number of times and then add the digits of the resulting number, you’ll again get nine. Example: 9×3=27. 2+7=9. Magic, I tell ya! 😉 That’s why 9 is also considered the ultimate magical number in all world’s numerological systems. I love the Year of the Horse! 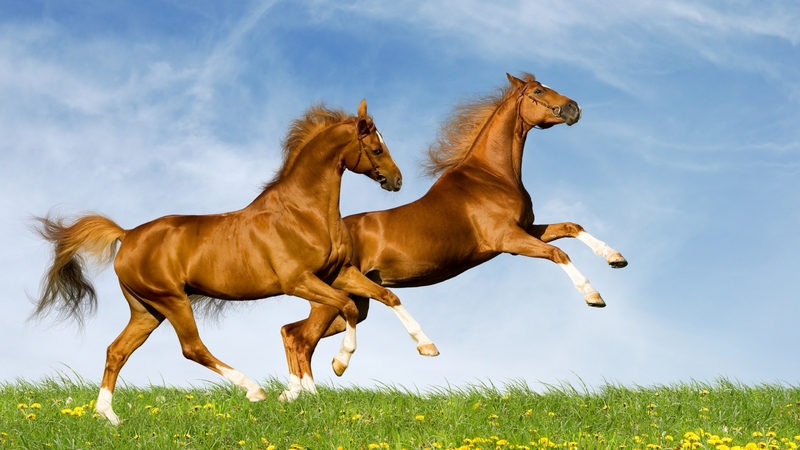 Horses are beautiful and free. I love displaying jade and bronze horse images in my home at any time, and doubly so this year! Although my sign isn’t a Horse, I have a special affinity with the Horse as my personal SUCCESS number is 9 and my personal success direction is the South. If you are interested in a consultation which will reveal your success numbers, directions, colors and much more, you can contact me for a skype or email consultation here or go to the bottom of this post for more. What to wear for your New Year of the Wood Horse celebration? 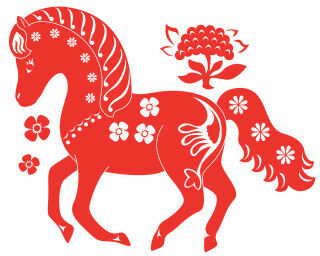 The colors of the Year of the Wood Horse are RED and GREEN. In the Chinese elements system green = wood; red = fire. Wood symbolizes growth and also wealth (depending on its shade), and red symbolizes energy and action. If you wear a combination of these two, you’ll definitely greet the New Year of the Horse in great style! It is said that the Year of the Horse is always special as the horse symbolizes great freedom, prosperity, good news, fame, fortune and energy. This year is doubly special, as the added wood element makes the fire of the horse burn brighter and even more ferociously, if left unattended. The great multiplier, number 9 further multiplies the effects of this year, both good and bad. What does all this mean for the world and each of us individually? On the positive side, there are possibilities of great initiations and the energy is terrific for new ventures, expansion, bringing plans to fruition, fame and for some – even wealth. Another positive this year is that we have the so called LAPCHUN, or the proverbial “spring.” In the Chinese system Lapchun doesn’t happen every year, and when it doesn’t, it is hard or counterproductive to start something new as it will not take off. The great news is that this year we have Lapchun, therefore, new shoots, new beginnings will take root! In the advanced Flying Star Feng Shui, we combine the Chinese numerology with the Compass School of Feng Shui to achieve best results. In the Flying Stars system, the ultimate good fortune White Star #8 co-incidentally happens to fly to the SOUTH, the seat of the Horse. Therefore, anyone associated with the sign of the Horse, #No. 9, or South as one’s lucky direction, will benefit greatly from 2014! The luckiest sector of the house to be in 2014 is South. Note, this is not because this is the Year of the Horse, but because of the #8 White Star. Tai Sui, or the guardian of the year, also just happens to travel to the South this year. As we see, there is an unusually high concentration of different contradictory forces and signs associated with the South in 2014. Tai Sui is a very powerful invisible presence, and as such, he really likes his peace and quiet. So, despite the fact that we have the #8 Lucky Star here, which encourages a lot of activity, it is highly advisable to keep your home’s Southern sector quiet this year. This applies to the world events as well. See more below re. my world predictions for the year of the Wood Horse. Please see the Feng Shui page for more on the Flying Star Feng Shui and the Compass School. Due to the volatility of the Wood Horse combo, the events in the world will tend to spiral out of control. Tempers, ignited by the fire multiplied by wood, will flare much too easily; fights may be gloves off and very ugly. Natural and man-made disasters, especially related to fires and explosions, will further intensify. Various rebellions, violent protests around the world will unfortunately continue. Protests against rotten and corrupt systems will continue and intensify. However, these protests will lack reason and will tend to spiral out of control, as well as be hijacked by interests with ulterior motives, as we are already seeing happen in countries such as Egypt and Ukraine. Tying this point with the above: disturbing the energy of Tai Sui with anger and violence will most likely backfire – and not just in the South of the world. Here I have to dig deeper into this decade: we are going through a MASSIVE tectonic shift in consciousness and global structures. Whatever is not fastened well, will be blown away, whatever was not solidly built, will crumble and be replaced. This is true for the entire decade: various angry and violent protests, as well as revelations of conspiracies, corruption and greed, will continue. So, anchor and fasten everything in your life, and build your structures solidly, if you don’t want them to be blown away! In conclusion, I will mention that as with anything, while senseless violence in the world continues and intensifies, at the same time, new forces are rising that will eventually replace the present rotting socio-economical system with a more equitable and more sustainable system. Such forces are growing both in the East and in the West. The Year of the Wood Horse is a terrific year for the consolidation and further advancement of such forces! Happy New Year of the Wood Horse! May it bring you success! COPYRIGHT 2014 Lada Ray, all rights reserved. No reproduction of any part of this post is permitted without expressed author consent. Worpress reblogs with brief quotation, as well as link-backs with full credit are welcome! Twitter, Pinterest, Linkedin, FB, G+ mentions are welcome! Interested in a personal consultation or workshop? Please go to FENG SHUI Services for details and contact info. An a very Happy Chinese New Year to you too, dear Maddie! Best of luck in all your new enterprises and auspicious beginnings this year and always! I love the post and the photos of the horses are awesome. Such beautiful creatures. Wishing you a Happy New Year of the Horse. Happy New Year and best wishes to you and family! Thank you, dear! So happy you enjoyed my books and blog! Great to hear from you, always! 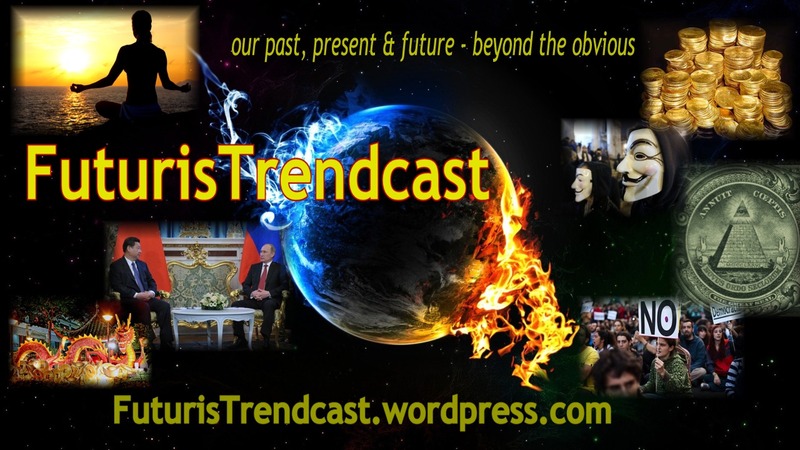 Pingback: Lada Ray: Prediction: Deal of the Century Between Russia and China – Huge Blow to the US and EU | 2012: What's the 'real' truth?